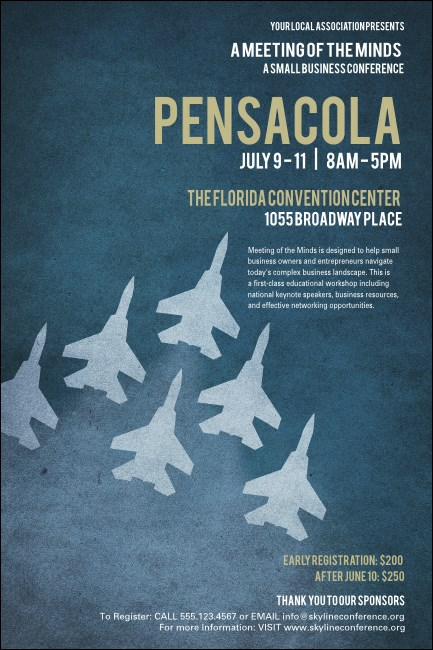 Showcase your next Panhandle event in a big way with the Pensacola Poster. This poster showcases six jets in formation in the deep blue sky over Florida. Whether you're promoting a concert, conference, or fundraiser, this bold design makes a patriotic impression in the city with the World's Whitest Beaches. Need more materials for your Naval or Aviation event? Choose a Pensacola Even Kit from TicketPrinting.com.